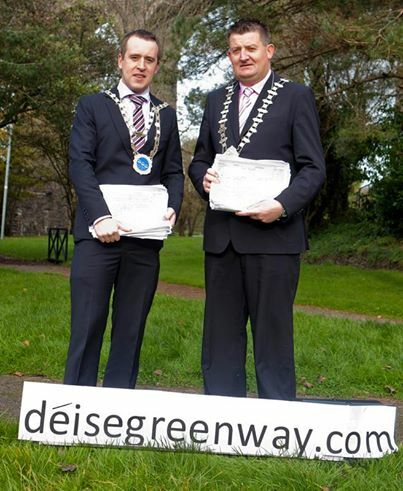 Both the Mayor of Waterford County Mr Damien Geoghegan and the Mayor of Waterford City Mr John Cummins today asked us to release the following statements, showing their overwhelming support for the Greenway. "At the January Meeting of Waterford Co Council, the newly-appointed County & City Manager Michael Walsh gave a very firm commitment to the provision of the Greenway. In his first public comment on the issue, the Co Manager stated that it is "AN ABSOLUTE PRIORITY FOR THE COUNCIL"..... "IT IS GOING TO HAPPEN" ....."PRIVATE GOOD CAN'T OUTWEIGH THE PUBLIC GOOD" ...."WE WILL HAVE THE GREENWAY" ....He has outlined to me on more than one occasion that he sees the GREENWAY as THE FLAGSHIP PROJECT for Co Waterford and it's great to see Michael Walsh spelling out clearly his determination to deliver this project...onwards and upwards!!" "I requested that the Deise Greenway be put on this evenings agenda and the CPG unanimously endorsed the proposal last week. Director of services Fergus Galvin presented and outlined details of a joint Waterford City & County Council proposal to develop a 3meter wide, 10km track between Bilberry & Kilmeaden alongside the Suir Valley Railway. This €1.3million project was presented to Minster Varadkar during his visit to the City in November & from speaking with him, he is very favourably disposed to the whole greenway - not just this section. Separately Waterford County Council have lodged an application for funding for the next phase from Clonea to Durrow. National funding announcements for such projects are due shortly & I certainly hope one or both of these phases will be included. This is very positive news and as articulated at the presentation of the petitions, this is a priority project & one which will be a jewel in the crown of our newly amalgamated authority!""